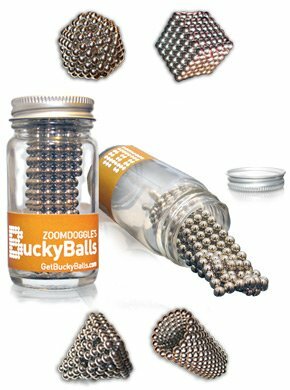 On July 10, 2012, the Consumer Product Safety Commission instructed Maxfield & Oberton to file a “corrective-action plan” within two weeks or face an administrative suit related to Buckyballs’ alleged safety defects. Around the same time—and before Maxfield & Oberton had a chance to tell its side of the story—the commission sent letters to some of Maxfield & Oberton’s retail partners, including Brookstone, warning of the “severity of the risk of injury and death possibly posed by” Buckyballs and requesting them to “voluntarily stop selling” the product. It was an underhanded move, as Maxfield & Oberton and its lawyers saw it. “Very, very quickly those 5,000 retailers became zero,” says Mr. Zucker. Running this man’s company out of business wasn’t good enough: despite years of legal precedent to the contrary, Zucker is now being personally sued by Your Benevolent Government. It’s pretty clear this guy has been targeted. How does this happen in a free society? Maybe because we’re not as free as we think. At best, this is the kind of invasive nanny-state nonsense that’s been all the rage in Europe for years. At worst, it’s another sign of our descent into Banana-Republicanism. Neither option has ended well. You can’t just upend the system of laws that undergird your society without eventual catastrophe. What investor in their right mind would commit their time and money to anything in a capricious system, knowing it can suddenly turn against him for no good reason (which is more likely if he hasn’t made the right friends)? From Argentina to Zimbabwe, every country that’s gone down this path has ended up in squalor. When entire agencies of unaccountable paper-hangers start making things personal, then before too long the citizenry is left to decide between two bad choices: obey or revolt. Given our history, my money’s on the torches and pitchforks though Uncle Sugar’s doing everything possible to tamp down those leanings. One burning question I have that wasn’t answered in this piece: what is Mr. Zucker’s political affiliation? Because that seems to be a thing with this crowd.